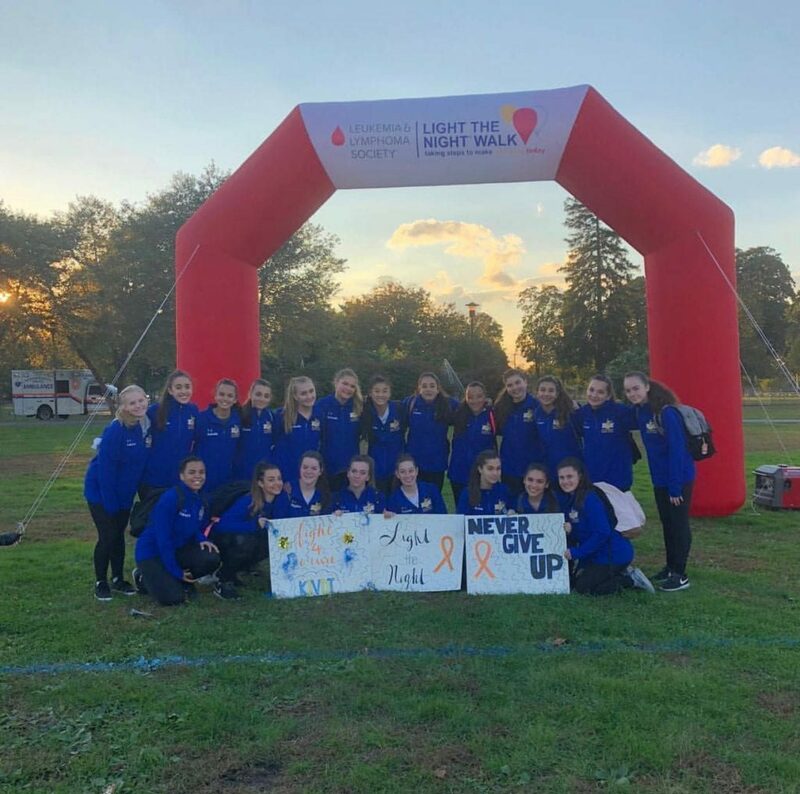 During the month of October, Kellenberg’s Junior Varsity Dance team took the time to work hard for a great cause. Their mission this year for the Service Over Self (S.O.S.) project was to raise money and volunteer at the Light the Night Walk. The Light the Night Walk raises money to support the Leukemia and Lymphoma Society (LLS). On October 20, 2018, thousands of family members, friends, and supporters gathered at Eisenhower Park to celebrate, honor, and remember those touched by cancer. As stated on the LLS website, ”When you or someone you love hears the words ‘you have cancer,’ it’s one of the darkest moments in your life.” The LLS society explains the Light the Night Walk as a way to lift and drive out the darkness of cancer. The light and warmth generated delivers hope in a time of despair and community in place of loneliness. The 2018 Junior Varsity Dance team, made up of 24 girls, united together and connected with the organization raising over $100 dollars. Upon arrival, participants were greeted with smiles and given lanterns. Red lanterns represented supporters, white lanterns symbolized survivors, and the yellow lanterns were for those who lost the battle. As the day became night, the sky illuminated in red, white, and yellow. The stunning display of the three colors was a sight to see. Each lantern was a beacon of hope, a picture of strength, and a visual of support a community gathered can give. This cause was especially close to the team’s heart because last month their school lost classmate Dylan Murphy, an incoming 7th grader and to cancer. Dylan was the brother of John Murphy, a current 9th grader. The team made up of 9th and 10th-grade girls, some of whom are close to the Murphy family and have classes with John, felt privileged to be able to memorialize Dylan in this way, which then gave this day more of a purpose. Those walkers in attendance who have lost a loved one due to cancer were able to honor that person at the Remembrance Pavilion. The Remembrance Pavilion is where the team left notes of tributes to Dylan as he rests in peace. The Murphy family gathered with the team and prepared to cheer on the thousands walking. The excitement in the girls and the warmth in their smiles gave the walkers motivation to continue on the mile path through the cool brisk temperatures. Thankful and grateful to be a part of such an amazing event, that was the moment the team realized what service over self truly meant. Getting the opportunity to donate and support through dance was a fulfilling experience for everyone involved. The Junior Varsity Dance team encourages the student body and family members to do what they can to be of service to others.